WEST PALM BEACH, FL– How does a performing arts center provide audiences with a wide array of talent every year and grow successful community outreach programs? 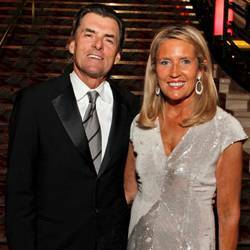 A lot of ticket sales – and a band of loyal and generous supporters, more than 400 of whom turned out for the Raymond F. Kravis Center’s 2013 gala. The annual black-tie event, held Jan. 21, 2013, was chaired this year by Monika Preston, along with Honorary Chair Kathryn Vecellio and Vice Chair Kim Havlicek. Junior co-chairs were Angela Culveyhouse, Cameron Preston and Tara Vecellio. The evening began with a cocktail reception, followed by the eclectic sounds of Pink Martini. Under the direction of pianist Thomas Lauderdale, the renowned group performed a variety of classical, jazz and pop tunes. Dinner and dancing was next in the Gimelstob Ballroom, awash in pink and platinum décor and accented with elegant sprays of cascading white phalaenopis orchids atop silver vases. A highlight of the evening was the announcement by William A. Meyer, the Kravis Center’s outgoing chairman, of three major financial gifts to the Kravis Center this season, including $1 million from Barbara and Jerome Golden. Their gift will help expand the Center’s arts education program for the 50,000-plus children and teens the Kravis Center serves every year. 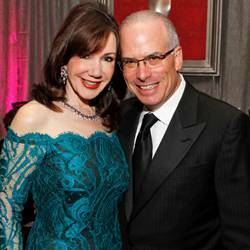 Laurie Silvers and Mitchell Rubenstein. 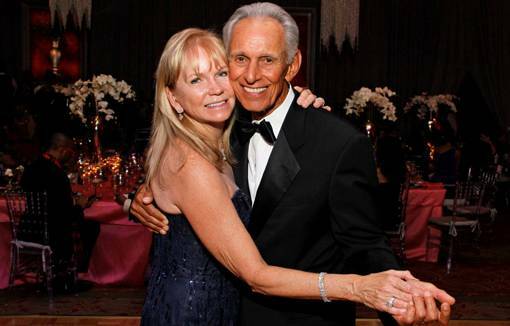 The two other gifts received by the Kravis Center earlier in the season were an MLDauray Arts Initiative grant of $1.25 million from Mary Lou and Alan Davis in honor of his late parents, Leonard and Sophie Davis, and a $1 million gift from the Lawrence J. and Florence A. De George Charitable Trust. The MLDauray grant is underwriting the new P.E.A.K. (Provocative Entertainment at Kravis) series at the Kravis Center, while the second gift is funding the new De George Academy for the Performing Arts. Gala performance sponsors were Myrna and John Daniels and Henni and John Kessler. Additional sponsors included Helen K. Persson (décor), Monika and John Preston (reception), Kathryn and Leo Vecellio (dinner), The Breakers (bar and wine service), Laurie Silvers and Mitchell Rubenstein (“Rising Stars” table), Ingrid and David Kosowsky(education programs), Martin Axman and Phylis Fogelson (photography), Stephen Brown and Jamie Stern (public relations), Julie and Amin Khoury (dinner dance orchestra), Jack and Goldie Wolfe Miller Fund (invitations and programs), Jane M. Mitchell (valet services), Lawrence Moens and Gisele Coutinho (star sponsors) and Tiffany & Co. for special support.